Would you recommend LedBetter to a friend? Hi all! I am the Co-founder of LedBetter, the app designed to promote gender equality in leadership at the world's biggest consumer brands! We make it easy to search, see and share the gender ratios on the executive teams and boards of directors for over 2,000 products. We hope people we get informed and shop accordingly. What surprised us was how many brands market predominantly to women yet have no women in major leadership positions — this includes the likes of Mattel (maker of Barbie) and Victoria's Secret. We'll be here to answer questions and would appreciate any help spreading the word! @camillericketts this is amazing! are you thinking about incorporating race data in the future as well? @sa Yes! We're already mobilizing for the next phase, and that's definitely next. Also interested in shedding the same light on educational institutions and government agencies! This is much needed and so smart. What a wonderful and compassionate way to put gender equality on display, factually. @hnshah Thanks so much for the kind words and for sharing! Your support is always incredible. The ratio amongst TV networks was pretty surprising for me - especially Oxygen Media. They target young women but they have 0 female representation in executive leadership. That's insane. @thecoolestcool Agreed! My mind is also blown by Mattel, which makes Barbie and has 0 women executives. L Brands, which owns Victoria's Secret, also doesn't have any! Nice work, @camillericketts. Example from Facebook: How are you getting this data and keeping it updated? Sounds challenging. Any particularly interesting insights working through this? @rrhoover Thank you so much! Your support means a lot to me! @rrhoover Sorry just saw your questions. 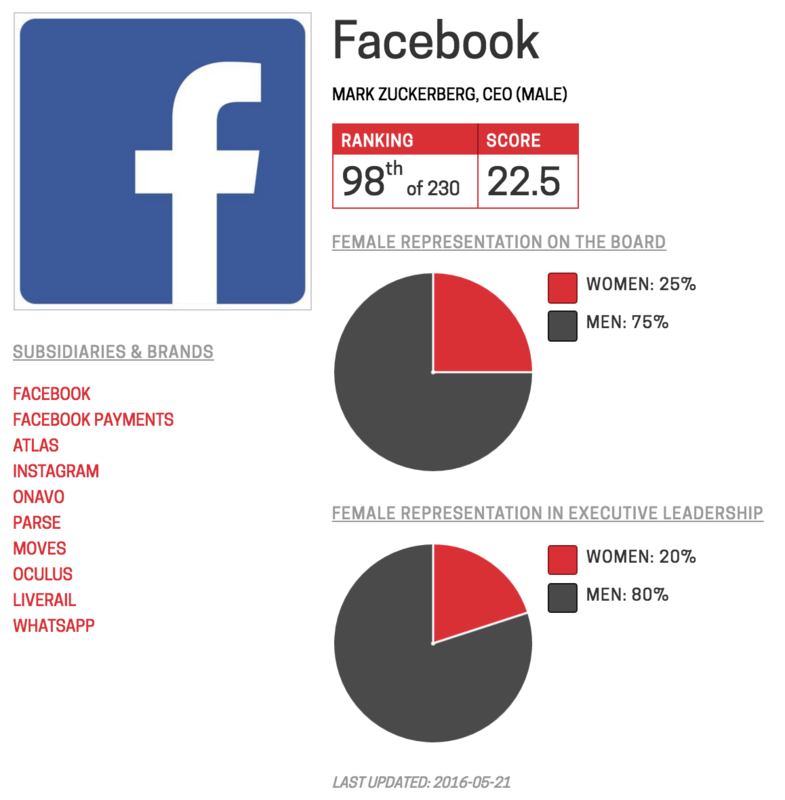 To keep it updated, we're tracking any changes to the corporate governance pages where we mined our data and compulsively updating in real time :) In terms of insights, I think the most surprising was how many companies that market predominantly to women actually have none or very few in leadership. Thanks for asking! Amazing! As a recruiter, I think this tool could raise awarenes regarding the selection and promotion of women. Love it!